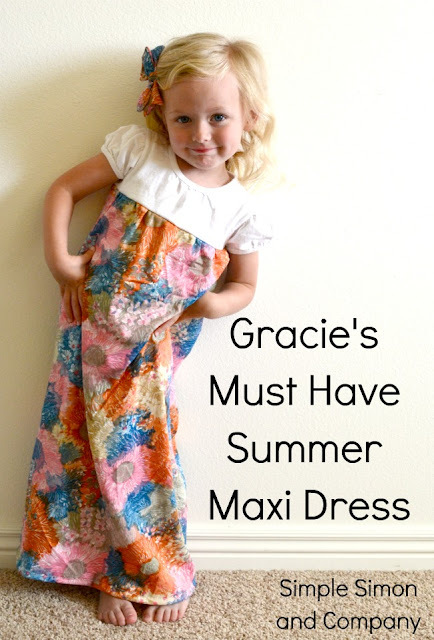 Today I am sharing a quick and EASY girls maxi dress tutorial! I made this dress for Gracie the other night and she wore it all day yesterday…it’s a new favorite. When I had the idea I wasn’t sure how it would turn out so we used some crazy supplies but now that I’ve made one I want to make like 10 more and this time use nicer T-shirts and some of the “good” polyester from my secret hoard. 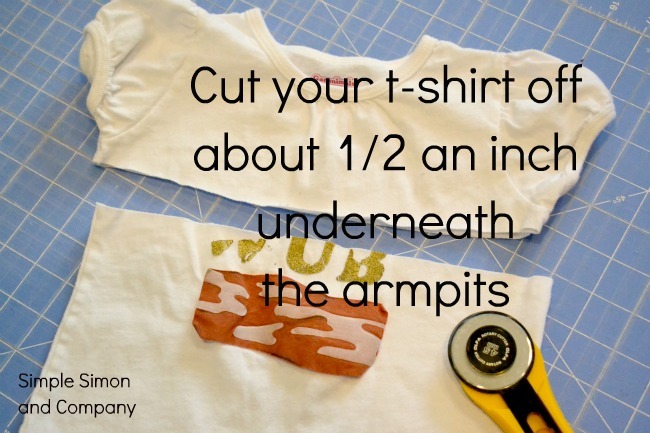 For the width: I cut my fabric 3 times the width of the shirt (so if it was 10 inches wide I’d cut it 30 inches wide). 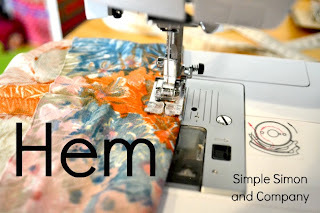 For the length: I had Grace put on the chopped shirt and measured from the bottom of the shirt to the floor and added about an inch and a half for seam allowances and hemming. To do this run a loose stitch around the top of your skirt and pull it (rearranging the gathers as you go) until the skirt is roughly the same width as your shirt. I tried the dress on Gracie and then pinned it to the length that I wanted before I sewed a stitch. Yes, I really am going to make some more. And then because it looks so comfortable I kind of want to try one for myself…I like the idea but am wondering how it would translate into a mom dress…hum…I’ve got to think about this…. What do you think? Would it be worth the polyester sacrifice? Until next time…Happy Thrifted Thursday! 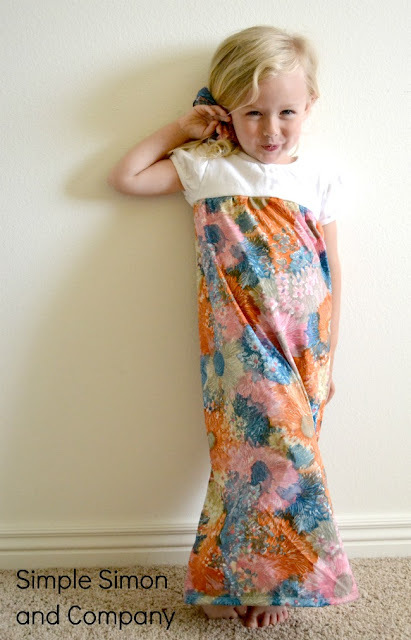 I’ve been on a maxi dress kick too, making one for my older daughter by lengthening a tank top pattern and one for me using a new McCalls pattern. And I also used similar methods to your maxi dress for Gracie by taking a tank top and some ruffle fabric to make a dress for my two year old. We’ve been a bit dress crazy over here, but I think Gracie’s version may be my favorite. I think a maxi for mama would be great! I’d suggest cutting the shirt below the breast line to ensure maximum comfort. 🙂 I’ve been wanting to make some dresses for myself, but i’m the type of girl that really admires dresses, but never actually wears them. I’m more of a yoga pant mom LOL! that is sooooo cute and just what I needed. Lucy grew out of a maxi dress that I made last summer and she’s so sad. I’m gonna chop off the top and sew it onto a t-shirt! yea. I might do it right now so I don’t forget! I totally have that fabric!! I’ve been hoarding it for YEARS! Ha! Now I have a reason to use it! Yeay! I love this and I know my daughter would too. What a great way to use up some of the shirts that need some updating. so worth the sacrifice! love it! She totally looks like a starlet in that last pic! Gracie and the maxi-dress….great combination!! Thanks! Oh this is just so cool. Thanks for sharing! Sewing in no mans land has a great “mommy Maxi” dress. I made one and the steps are almost identical to this. Its very easy and cute. Maxi’s are so on trend for summer! IT is SO CUTE! I have been planing on doing something very similar. My daughter loves it when I make her things out of tee shirts. I featured this on my blog last night. So cute! How about trying a long/short skirt too. Not too short in the front though. This is super cute!! My daughter would love it! 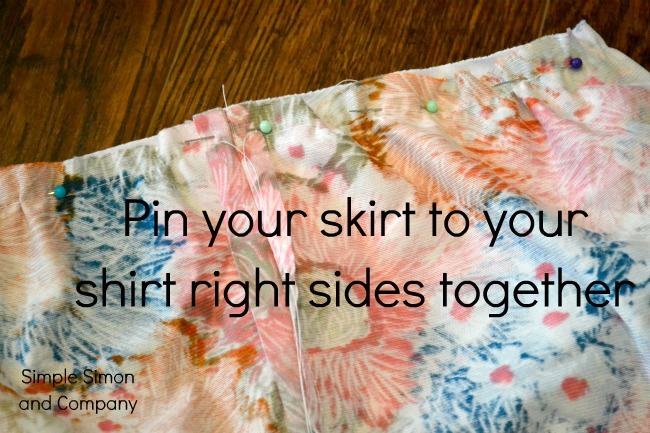 This is a wonderful and inexpensive idea! 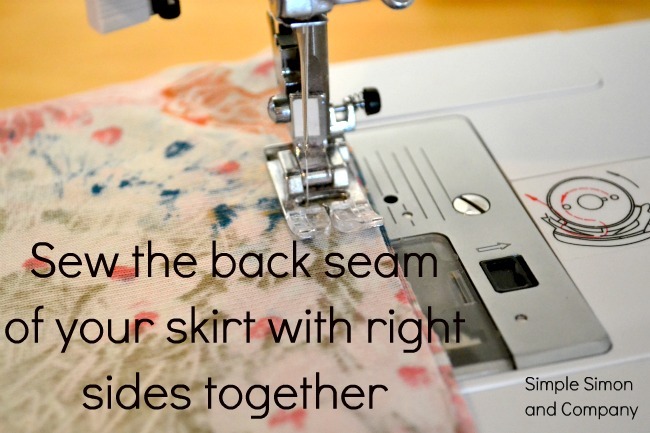 I love how easy the instructions are… I think any mom could make this… even if she hasn’t sewn in a few years (make that 8!) 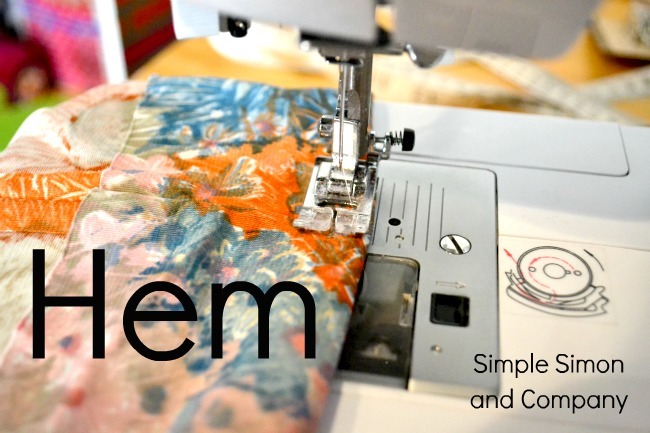 Time to get back into it with this great project I think – YES! Adorable, your little Gracie is too :), but my granddaughters get stains all over the tummies of their little shirts and this is a perfect way to salvage (re-purpose) them. thak you so much for the ideas! I love this tutorial and have just made the first of what i hope will be many. I could even see the same thing for me…. This dress is so cute! I’m your newest follower 🙂 I can’t wait to try out this maxi dress! This is adorable ….. and since kids mostly grow UP, she will be able to wear it for a long time. Thinking “no” on the mom dress. gathered high waist always screams “maternity dress” in my siZe, lol. 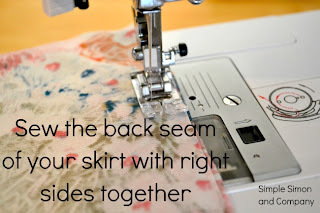 This is so cute and super easy even for someone just learning to sew like me. Thank you so much for sharing this, my girls are going to love having these to wear around this summer :D. I know what I am going to be making a ton of now. Just made two maxi’s in about one hour! Thank you so much! My girls look so cute. 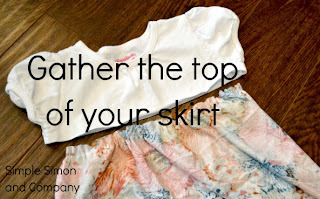 T-shirts from a bag of hand-me-downs and some left-over fabric form my stock! Super easy and cheap!!! You rock! Picturing a button front (polo) style for my 9 yr old. Thanks for the tutorial!!! Picturing a polo style button front T for my 9 yr old. Thanks for the tutorial! Absolutely adorable!!! Great job! Thanks so much for the tutorial.Tons of blessings. 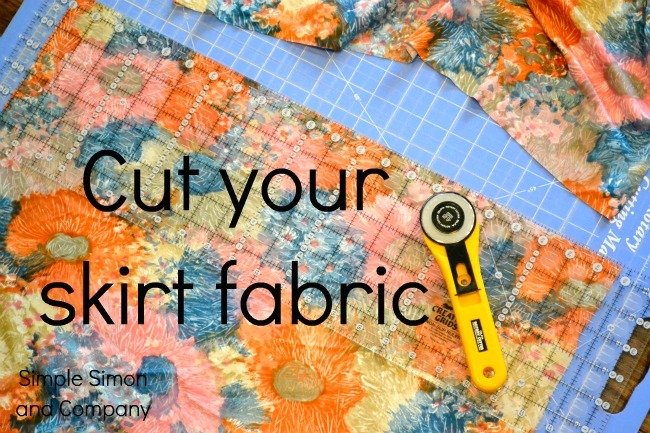 After seeing this tutorial and pinning it I HAD to make it for my daughter. Here’s a link to my blog with pictures of the dress. Thank you so much for the easy-to-follow instructions. I was sure to link back to your page to give credit for the idea. Thanks again! It is TOO cute!!!! I’m featuring this tomorrow on my weekly round up!!! Hope you have a wonderful week! Wonderful! I made a dress for my daughter this afternoon with some scrap fabric and an inexpensive tshirt. Lovely dress! She loves it and I love that it was easy to make and she can wear it to church or to play in the yard. Thanks for such a great tutorial!